not even oriundo- calcio without citizenship: Italy vs Sweden Thoughts: What is this Italy? Italy coach Gian Piero Ventura said this week that he hasn't even considered his team not making the World Cup next summer. But almost a month ago he had. Italy had just drawn 1-1 against Macedonia in Turin, and Ventura was frank: "If we play like this, we will not qualify for the World Cup." 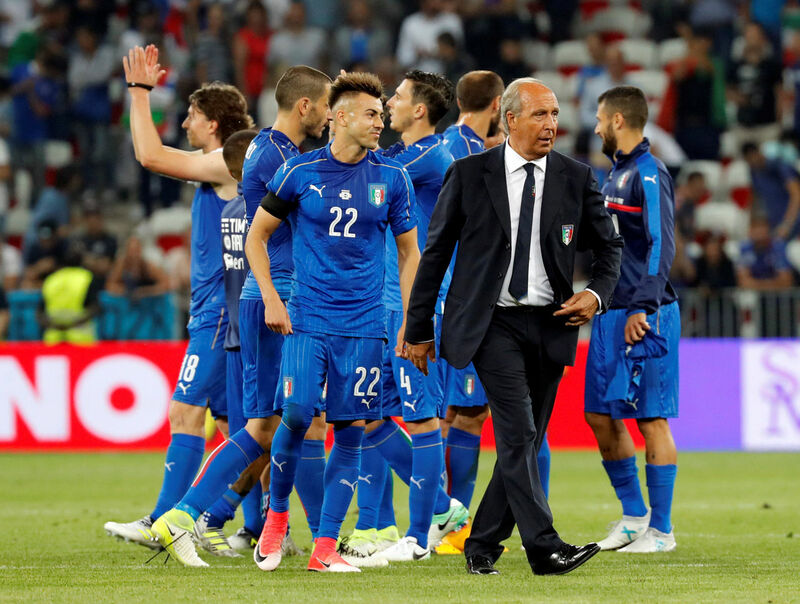 Three days later, Italy eked out a 1-0 win against Albania in Shkoder, guaranteeing themselves a playoff spot for the World Cup, and Ventura maintained that he had always remained fiducioso (confident) of their progress. "We made small steps forward," he said. "But I have been and remain confident." Ahead of Italy's play-off against Sweden tomorrow, many outside the Italian camp seem less confident. It is not that they believe Italy doesn't have what it takes; it's more that they don't seem to know what this Italy has. The last time the Azzurri had to negotiate a two-legged play-off to reach the World Cup was against Russia in 1997. Coach Cesare Maldini could call upon Alessandro Nesta, Fabio Cannavaro, his own son, Paolo Maldini, Demetrio Albertini, Alessandro Del Piero, Fabrizio Ravanelli, and Christian Vieri. Italy prevailed 2-1 on aggregate and reached the quarter-finals of that World Cup, where they lost out to the hosts and eventual winners, France. Almost exactly twenty years later--a last-gasp Wiltord goal, a South Korean debacle, a Totti spitting incident, a Grosso World Cup winning penalty, a Pirlo panenka, and a Simone Zaza chicken dance later--Italy are currently a team that could be or could not be Italy. Over the past few months, Ventura has methodically dismantled all of Antonio Conte's work. Ventura's work has almost been a perfect inverse of his predecessor's. He has almost got it exactly wrong: Italy's 3-0 defeat to Spain in September came a little over a year after Conte led Italy to a commanding 2-0 victory over Spain at Euro 2016. That Euro2016 victory against Spain in Paris should have been the reference point. Since then, however, Ventura has managed nothing of note with virtually the same set of players. "I am satisfied with my work," Ventura said this week. Admittedly, to come second in a group containing Spain is not a catastrophe. But to capitulate so quietly to that same team just over a year later should not provide satisfaction. When Conte achieved that famous win over Spain there was a feeling that he had extracted every last ounce of quality and expression from his players. He had, as Marcello Lippi once memorably said, managed to do what a good coach should: squeeze the lemons at his disposal. Where his Italy team were deficient, Conte compensated with a clear method, inculcating tactics and design to the point that Eder's and Graziano Pelle's legs managed magic in spite of themselves--to the point that that pairing could actually work for Italy at a major tournament. The gestalt of that Italy team was heartening. It distracted from some of the individuals, reinforced the belief that even if the players are not outstanding, coaches trained at the renowned Coverciano center in Florence could not just maintain equilibrium, but infuse the team with animus. But Ventura's Italy side haven't even played within themselves. The 69-year-old hasn't deployed his main attacking threats of Ciro Immobile, Andrea Belotti, and Lorenzo Insigne convincingly. They were all on the field against Spain but couldn't assert themselves. Two of those three were on the field against Macedonia in Skopje (Insigne missed out), but Italy needed the last fifteen minutes of the game to earn a chaotic 3-2 victory. Against Sweden, if Italy manage to be even a sum of their parts they should easily win, but the question around their quality will remain. Is it the case that Ventura is not exploiting his resources, or are his resources just not good enough? The answers were clearer twenty years ago, ten years ago, two summers ago. When Italy lost to France in 1998, the press turned on Cesare Maldini's defensive tactics, which wasted the talents of Del Piero and Baggio. When Italy won the World Cup, the press hailed, among other things, Lippi's ability to incorporate Simone Barone and Cristian Zaccardo in a team that contained Andrea Pirlo and Francesco Totti. When Italy lost to Germany at Euro 2016, Conte was excused, and the press focused on the indecency of those Zaza and Pelle penalties. This time, critics can't get their hands around the culprit. Ventura has been underwhelming, but so has Italy's nominal star player, Marco Verratti. Immobile and Belotti have at times looked an effective pairing, but at other times they have ghosted out of games. Gianluigi Buffon, Giorgio Chiellini, Leonardo Bonucci and Andrea Barzagli have been characteristically dependable, but Ventura has tried several permutations in defence. Even when Ventura invoked the time-honoured stereotype of Italian teams playing better under pressure a couple of days ago, it sounded as if it didn't apply to this team, as if he was merely assuming that his players had inherited that gene by virtue of nationality. Hopefully, he is right, and this Italy finally shows the fluency and fight against Sweden that we have been waiting for.